Peter Jackson's April Fools Joke Was a 'Star Wars: Episode VIII' Script? So, what would you think if Peter Jackson was directing one of the new Star Wars movies? Because I wouldn't be surprised if Lucasfilm/Disney is trying to make it happen. Hidden in that funky new behind-the-scenes The Desolation of Smaug teaser video released by Peter Jackson yesterday, on April 1st, is what could potentially be a huge movie geek Easter Egg / April Fools joke, or a massive tease at what's to come. Many fans noticed that at one point near the end, around 4:51, Jackson fumbles around his desk for artwork and a Star Wars script briefly falls out. We took a closer look ourselves and it's definitely there. See below! Here's a screenshot we took directly from the 1080P high def version of the upload, at 4:51 into the video, showing the script and its cover as clearly as I could get it. 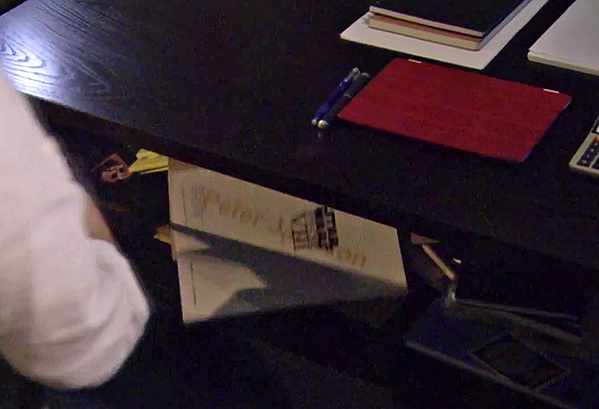 "Peter Jackson" is written across it along with the title block for Star Wars: Episode VIII. Yes that would be 8, not J.J.'s Episode 7, but the one after that. 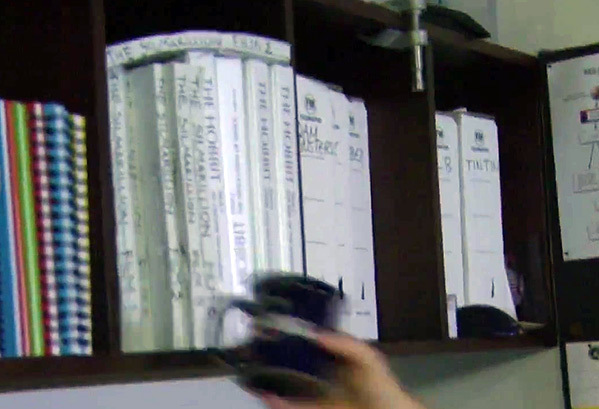 As noticed by one of the commenters below, also seen at ~2:39 into the video are a series of scripts on the shelf where the coffee mug is. A whole bunch of them say The Silmarillion on the side, while the others have The Hobbit in various incarnations. There are also Dam Busters, Tintin and a few more seen in there. I can tell from my own experience that visually at least it's a real script, with the name diagonal across it like that and even the other text below it. However, Jackson is a screenwriter himself and could easily create his own fake version of this kind of script in no time, so it's not all that revealing that it looks completely real. Head to YouTube to see the video yourself. Thanks to GeekTyrant and our commenters for the tip on this. Then again, what if it is real? We can certainly dream, right? How about that - J.J. Abrams directing Star Wars: Episode VII, then Peter Jackson directing Episode VIII. Heck, if they pull that off, who would they get for IX - Steven Spielberg? Wouldn't that be one hell of a line-up of Star Wars directors. Oddly, Jackson doesn't mention anything about Star Wars the entire video, but after watching it multiple times, the setup is too obvious with the script being on top of the art he's grabbing for it to be anything but planted for fans. It's likely nothing but a damn good April Fools Day joke, but an amusing one to consider the reality of at least. I've updated the article and added a screenshot of those other scripts as well, thanks to your tip. HOW DID YOU ABLE TO READTHAT?!? Damn you Peter Jackson. That was a cruel joke. Damn you. If it's an April Fool's joke, it's a pretty obscure one. He's counting on eagle-eyed fans to spot that title within a millisecond for the elaborate joke to work at all. "Yes that would be 8, not J.J.'s Episode 7, but the one after that." Ok guy, I think we know how to count. Ha I know, it was just a little blurry, hard to see... in case you couldn't tell (or don't know how to read roman numerals - hey not everyone can!). No one making jokes about how a Jackson-directed EPISODE VIII would be stretched out into a trilogy? Dear internet. I am disappointed. Peter Jackson is better than Star Wars. You can't print out a fake script cover? Wow. Wasn't this vid log a week before April fools? I guess in two or three years we'll know the answer. the silmarillion scripts are a joke, the tintin ones are real. The hobbit ones are rough drafts. The star wars one could be anything.